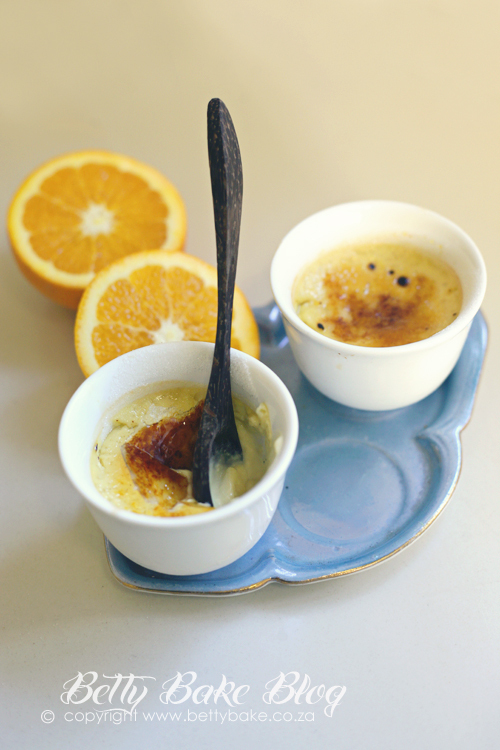 orange and honey creme brulee is my new favorite!!! It is so silky and smooth and just the right amount of sweetness with a good flavour - I just LOVE it!!! 1) in a small saucepan put the cream, milk and seeds scraped out from the vanilla pod as well as the empty pod into the pot. Slowly bring to the boil - just before it boils over -remove from stove top. 2) in a bowl/jug mix together the egg yolks and honey. 4) place it into the pot again and slowly heat while stirring, remove the vanilla pod. 5) cut open the orange and squeeze over the pot and taste. Keep adding orange juice until desired taste is reached ( i usually squeeze one lasrge orange into the mix) - let mixture thicken slightly from stirring over low heat. 6) pour into ramekins or tea cups. I love your vanilla creme brulee...my favorite...I am going to try this...will give you feedback after. Wow cant believe it took me so long to stumble onto your blog, your desserts look divine. Love the orange idea very inspiring. These look fantastic! Can just imagine the great flavor combination. These would be special treats for a bridal shower! This brulee sounds utterly delicious!! It was so nice to meet you last night! I've been obsessed with orange flavoured stuff of late...esp. that Woolies organic orange dark chocolate with the chewy orangey bits...so good! Your creme brulee looks excellent! 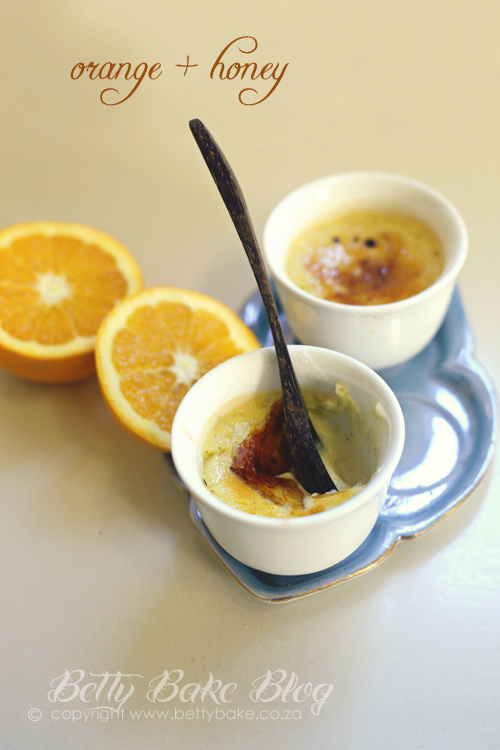 Oooo I love creme brulee and these look fabulous. @Juanita - thanks - orange stuff is delicious 0 i know exactly which chocolate you are talking about and its yummy!